Thirty percent of the textbooks stocked by the Boston College Bookstore this semester were available for rent at half the price of a purchased volume. Daniel J. Lasker, an Israeli scholar of Christian and Jewish polemics of the Middle Ages, assumed the Corcoran Visiting Chair at the Center for Christian-Jewish Learning, while the Carroll School’s Alan Marcus was appointed to the inaugural Mario Gabelli Chair in finance. What had been the department of geology and geophysics has become the department of earth and environmental sciences, bringing designation into alignment with research focus. Valiant, a yellow Labrador retriever being trained as a seeing-eye dog by Brittany Baker ’11, became the first canine ever to occupy a Mod with the full knowledge and consent of Boston College officials. In other Mods news, a student was stabbed though not seriously injured during an altercation early on a September morning. Five non-students have been arrested in conjunction with the assault, and police patrols of the area were increased. A survey by Health Services concluded that no more than 10 percent of undergraduates smoke cigarettes. In response to perennial calls for the reinstitution of Midnight Madness to herald the basketball season, UGBC and the athletics department announced Ice Jam for October 26, a hockey and basketball pep rally in Conte Forum emceed by broadcaster Bob Costas; while the department noted, in its annual report, that the football, men’s and women’s basketball and soccer, and men’s hockey teams produced a combined record of 1,008-510-73 during the decade of the Oughts, as against the collective nineties record of 722-664-68. Papers were filed with Boston by a developer who hopes to replace the defunct Cleveland Circle Cinema with a 150-room hotel and retail complex. Taking a traditionalist stance, the Heights continues to publish its longstanding interview column “Voices from the Dustbowl,” although the area is fenced off during construction of Stokes Hall [see story here]; early in October, two of the three students queried declared the Honey Q Wrap their favorite “dining hall meal.” The entering Class of 2014 included 714 AHANA students—a record 30 percent—and also set a new high average for class SAT scores. Unrelated to either phenomenon, South Dakota is the only state not represented in the class. Over the course of a day, thousands of students stood in a queue that at its height ran from the Robsham Theater to Campanella Way and then east through the Mods parking lot—all in aid of securing tickets to an act called Kid Cudi. UGBC, sponsor of Mr. Cudi’s appearance in Conte Forum, is said to be considering a switch to online ticket distribution. The Law School and Tufts University began to offer a dual degree in law and environmental policy. 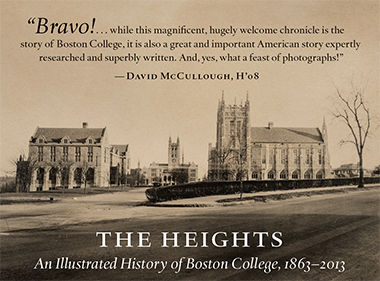 President Leahy appointed a steering committee that will plan Boston College’s 150th anniversary commemoration, which will begin in the fall of 2012 and conclude with the 2013 alumni reunion. The Digest quarterly Rankings Roundup: 31st in the nation in U.S. News, up from 34th place; 161st (of some 9,000) in the inaugural London Times World University rankings; and 27th on the Forbes list of America’s Best Colleges. As he promised he would, Mark Herzlich ’10, a standout football player diagnosed with bone cancer in the spring of 2009, returned to play this season. He led the team onto the field on opening day. Four books have been added to the “Dean’s List” of recommended reading prepared annually by former A&S dean William Neenan, SJ, for the last 28 years. The additions are Have a Little Faith, by Mitch Albom; Half Broke Horses, by Jeannette Walls; The Jesuit Guide to (Almost) Everything, by James Martin, SJ; and Say You’re One of Them, a story collection by the Nigerian Jesuit Uwem Akpan. Neenan’s accompanying essay notes—whether with pride or chagrin is not clear—that the last named was the first entry on the list also to have been recommended by Oprah. The Blue Heron Renaissance Choir, a Boston-based early music group, began a one-year residency. Zak Jason ’11, a Heights writer who apparently recently came of age, began a semester-long project of examining Boston’s bars with a visit to Mary Ann’s, from which he emerged noting, “I don’t loathe Mary Ann’s that much.” Reflecting the University’s “soft freeze” on hiring, this year’s employee directory weighed in at 151 pages, compared with 153 last year, the first such shrinkage in the Digest’s memory. According to research by the Sloan Center on Aging, accounting, Internet security, and nursing are among the professions most open to applications by job seekers over 40. Personal charitable giving, according to research by the Center on Wealth and Philanthropy, dropped 4.9 percent in 2009. Patricia Wetzel-O’Neill, former superintendent of schools for the Washington, D.C., archdiocese, assumed the directorship of the Roche Center for Catholic Education. The City of Newton installed parking meters on the north side of Beacon Street, and the Bookstore installed fitting rooms as part of a summer renovation, putting an end to the long tradition by which patrons left a driver’s license with a salesclerk while they tried on sweatpants in one of McElroy’s restrooms.